Yesterday I talked about how to create an Ubuntu virtual machine in VirtualBox and today I will walk through installing VirtualBox Guest Additions in Ubuntu. It, of course, requires using the command line! 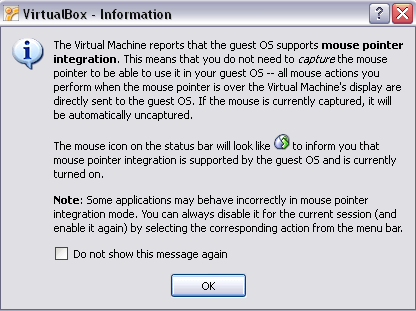 The VirtualBox Guest Additions are very similar to the Virtual Machine Additions that comes with Virtual PC. They basically add a couple of nice extra features that improve performance and allow better integration between the guest OS and the host OS. Ability to move mouse between guest and host OS without having to press the right CTRL key to switch. 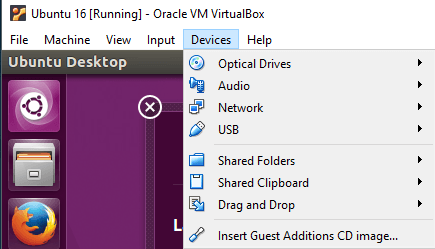 Automatic resize of the guest OS when you resize the VirtualBox window. Step 1: First start up your Ubuntu guest OS and then click on Devices and choose Install Guest Additions. Now the ISO for Guest Additions will be mounted automatically and you should see the CD icon on your desktop. 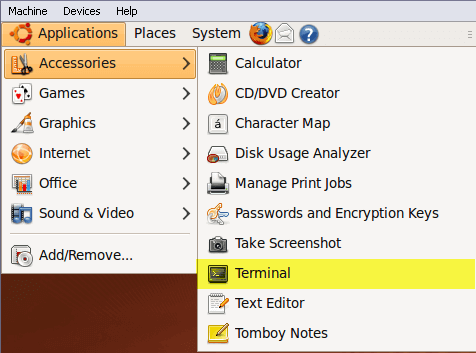 Step 2: Now while inside Ubuntu, click on Applications, then Accessories, and then Terminal. You can also use the ALT + F2 keyboard shortcut and then search for Gnome-Term. Then type ls to get a listing of the files. You may see something like cdrom or you may see a different name for the CD-ROM image. In my case, it was aseem, which was the name I used when installing Ubuntu. CD into that directory and do another ls. There is a directory starting with VBox that you have to CD into. When you perform an ls here, you should see several files, some for Windows and some for Linux. You’ll be asked for the Administrator password and then the install will begin. Step 4: The installer will create a few new folders, etc. and install Guest Additions. Step 5: After the installation has completed, you have to restart the guest OS. You can restart Ubuntu 16 from the command line by just typing sudo restart. 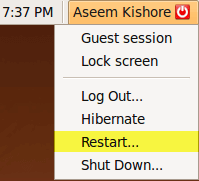 You can also click the Ubuntu button and restart from there. When Ubuntu loads up, it will display a message stating that the guest OS supports mouse pointer integration. If you see this message, it means you have successfully installed VirtualBox Guest Additions on Ubuntu. Now you can enjoy Ubuntu in a higher resolution than 800×600 since it supports 3D acceleration once Guest Additions are installed. Enjoy! Thank you for the great tutorial. Got me rocking in no time. I notice that in your quote as to what to type in the terminal to run the installer you only put "VBoxLinuxAdditions-x86.run" when in your images you have the full command entered which is the only way that worked for me as "sudo ./VBoxLinuxAdditions-x86.run". Just thought I would point that out to help avoid confusion. These instructions are completely wrong (maybe just radically out of date, I'm on Virtualbox 3.2.8 with Ubuntu 10). 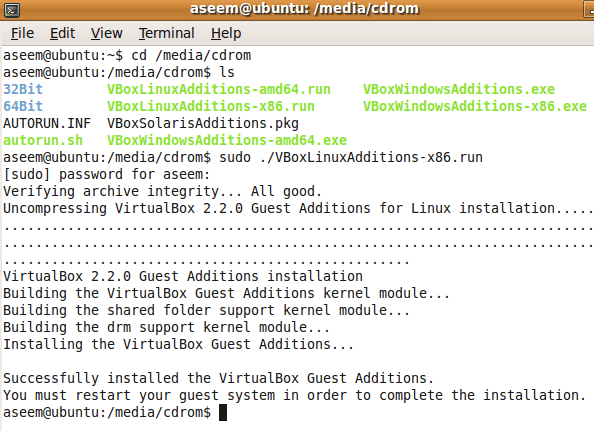 There is no cdrom in /media and nothing auto runs when you choose install guest additions from the Virtualbox menu. You access the guest additions disk by clicking the Places menu in Ubuntu and choosing the vboxadditions volume. In the window that opens you click the Open Autorun Prompt button to install. You will then see a progress window similar to the screenshot above, and it will say press return when it's finished. At that point you reboot to use the new drivers. Much easier than using command line.